The mountain range Cordon del Plata lies about 100 km west of Mendoza, the biggest town in West Argentina. Mendoza has approximately 1 Million inhabitants, so it is a quite large city. 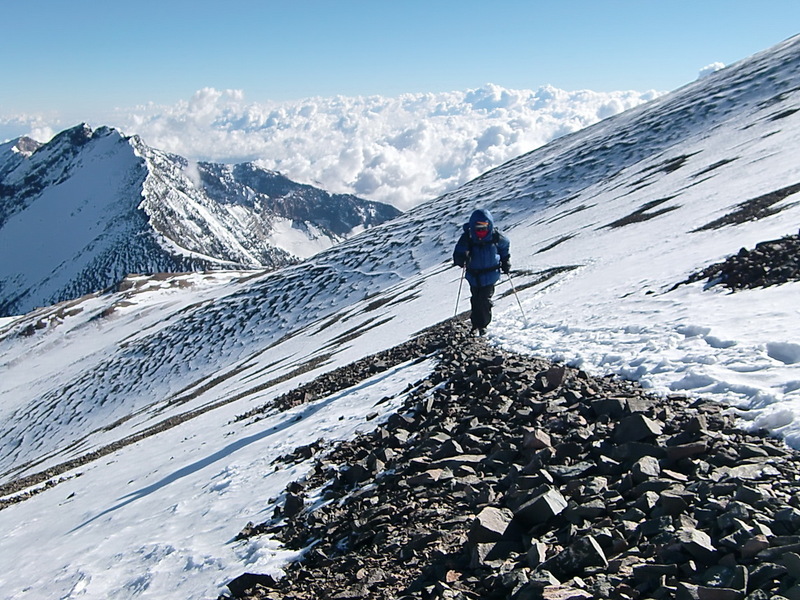 Cordon del Plata is one of the most popular mountain destination for the people of Mendoza. It is also a perfect acclimatization area, because a lot of mountains can be climbed, starting from 3000 meters up to 5930 meters. 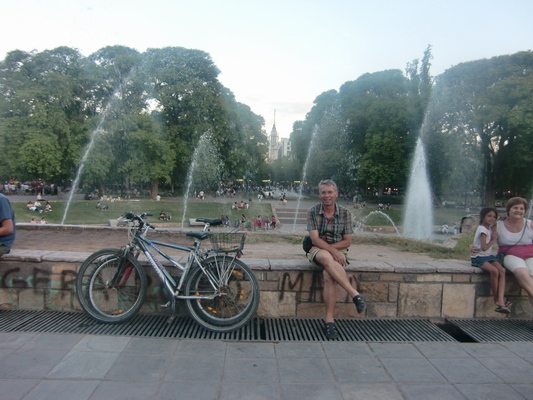 We started our trip in Mendoza, because there are all facilities like Internet, showers and shopping malls. We had been in Mendoza six years ago, and we were impressed about its progress. 2005, few years after the Argentine economical crisis, the streets and a lot of buildings were in a shabby status. Many people were demotivated and frustrated. But now we had the feeling that Mendoza is a pleasant city with modern shopping malls, beautiful places, nice buildings and friendly people. 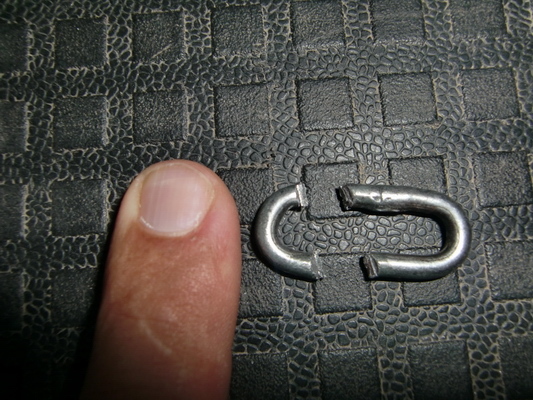 But it still has its hooks: Our bicycles were stolen on the parking area of a huge shopping mall. There was security staff in the mall and also on the parking lots. Of course we connected our bicycles with a reliable chain to our car. The security staff of the shopping mall forced us to go to Police. Fortunately there was German speaking lawyer, who asked a lot of question and did all the necessary paperwork. But we were sure that our bicycles are gone. Consequently we drove without our bicycles in the late afternoon of January 23rd 2011 to Vallecitos, the main entrance to the Cordon del Plata. 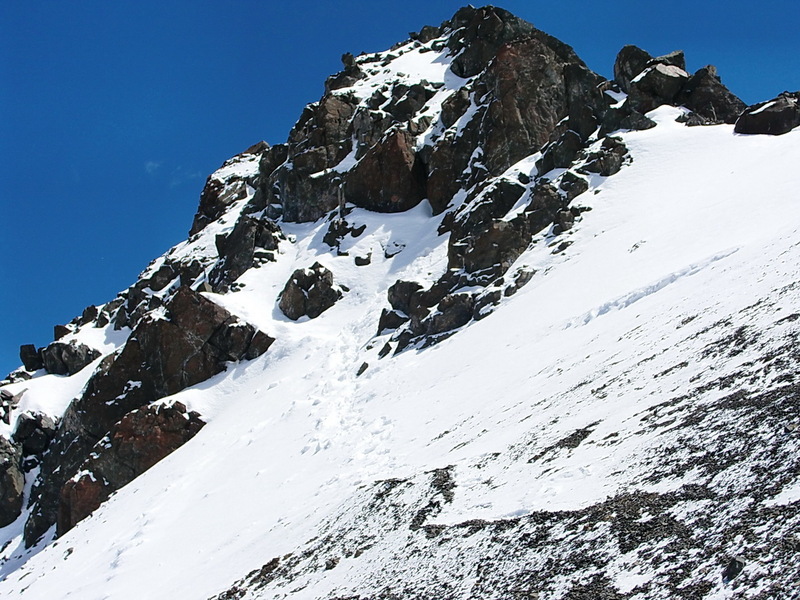 Vallecitos is the main skiing destination of Mendoza. There are several huts, ski lifts and different stuff to prepare the ski runs. 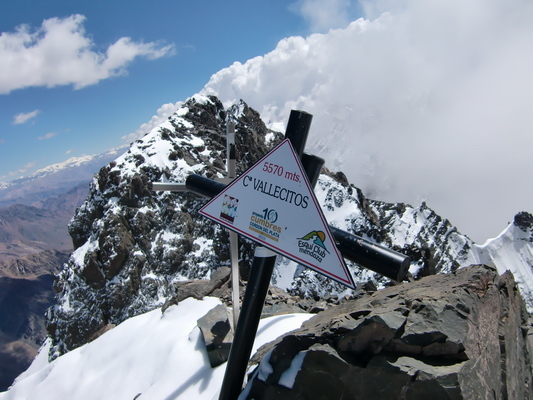 Vallecitos is closed to 3000 meters high; there should be sufficient snow in winter. In the evening we drank a lot of Argentine beer to drown our frustration about the lost bicycles. The next morning was beautiful, so we hiked to the Cerro Lomas Blancas, 3642 meters high. And to the Cerros Estudiante (3678 meters), Caucaso (3797 meters) and Iluso (3808 meters). Another good medicine to swallow our anger! It became darker and darker, when we walked down. Immediately we had reached our car, a violent thunderstorm with heavy lightening started. Good luck! It rained more or less the whole remaining afternoon, evening and night. The weather on the next morning was outstanding, but there was a lot of new snow on the higher mountains. We decided to hike to the Cerro Adolfo Calle, 4210 meter high and central in front of the highest mountains Cerro Vallecitos and Cerro Plata (5930 meters high). It is a quit long trip of more than 4 hours, one way. But it is a nice way, first through a steep valley and second over a vast plateau, the Cancha de Futbol (Soccer sport field). 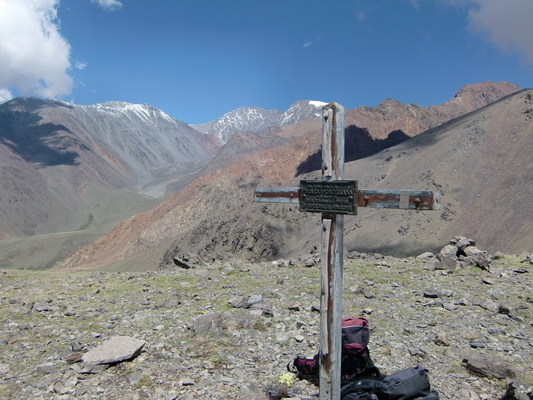 Finally a muddy slope with small scree led us to the summit of the Cerro Adolfo Calle, 4210 meters high. 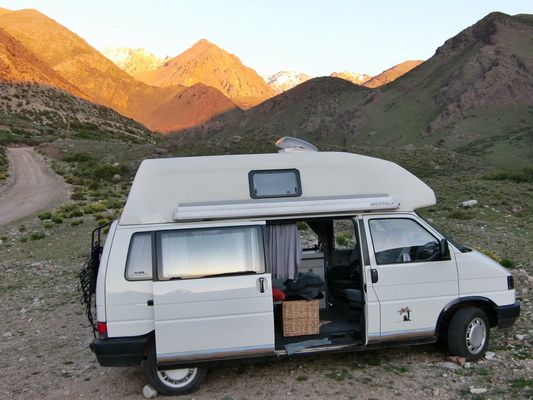 Alfred visited also its little brother, the Cerro Stepanek (4080 meters). And the clouds were coming again! Thanks to lose and tenuous scree the descent was very fast. In contrast to the previous day, next morning was also cloudy. 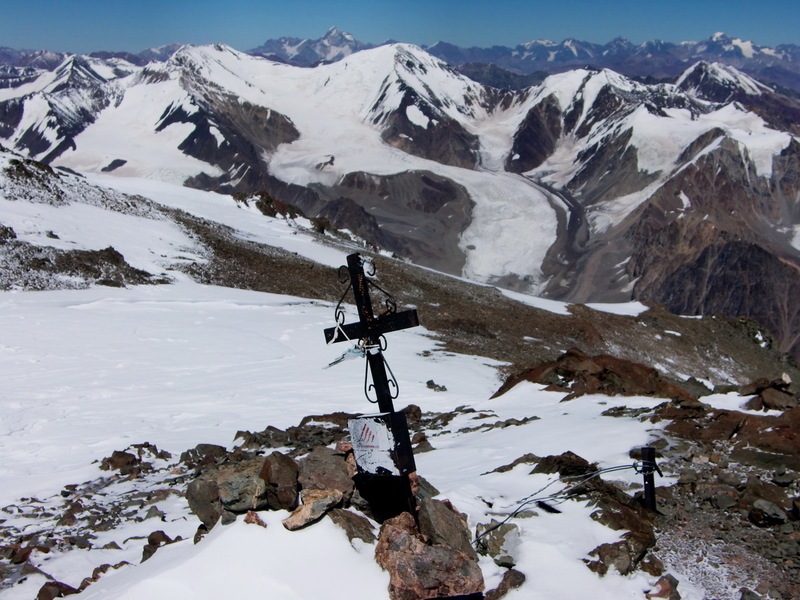 But we climbed to the Cerro San Bernardo (4100 meters high), another good acclimatization peak in this area. When we returned, it rained heavily with some dramatic lightening. So we skipped our original plan to go the base camp El Salto of the higher mountains the next day. Instead we drove down with our car few hundred meters to a nice placed on the river. It rained the whole night and morning of the following day! 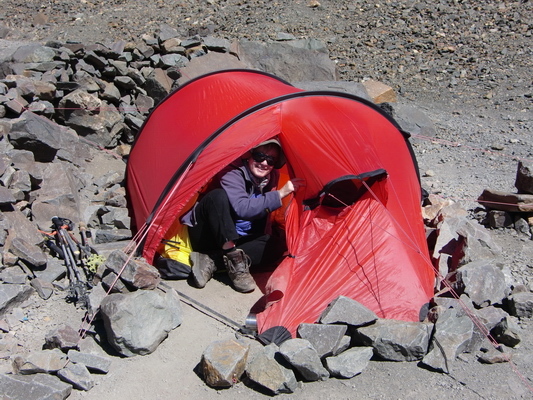 We decided to check on the next day if we go to the base camp El Salto or leave this area. The weather on the next morning was clear, so we headed up to Vallecitos again and booked one mule the next day to carry our stuff. Our idea was to stay four days in El Salto. We used this nice day to hike to the Cerro Arenales, just 3378 meters high. We returned early and packed our stuff for the next days. The weather was pleasant the whole day, also in the evening. But it started raining with heavy thunderstorm at 2:00AM! We were totally in the clouds the next morning with a visibility of less than 20 meters. No doubt we could not go the base camp. The mule drover Pancho forced us to postpone it one day more - Ok, this is our last chance! It became clear on the afternoon, so we made a very short trip to the Cerro Andresito, 3080 meters high, and less than one hour walk. 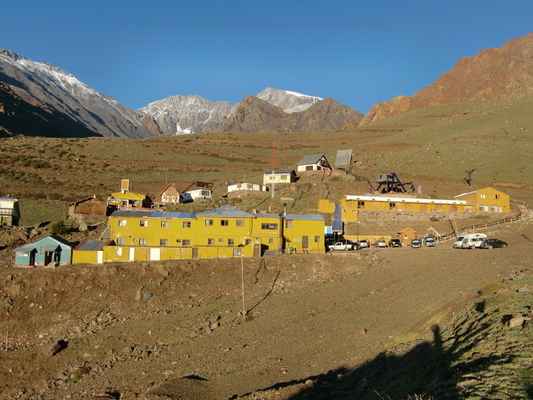 Of course the weather on the next morning was beautiful; consequently we went to the base camp on January 29th 2011 just with one light backpack, because the mule carried our heavy equipment. After two hours walking, we met Rosemarie and Marianne, which started their way from an intermediate camp half the way to the base camp. Rosemarie is an elderly Austrian Lady, who loves mountains. Marianne is her mountain guide, a younger Argentine woman. First we were surprised about female mountain guides, which are very rare in the European Alps. But we realized soon, that many young Argentine girls are working as mountain guides. They lead also men! Both had a big and heavy backpack, and we just one relatively light. So Alfred became also a mule and changed his light rucksack with Rosemarie's. 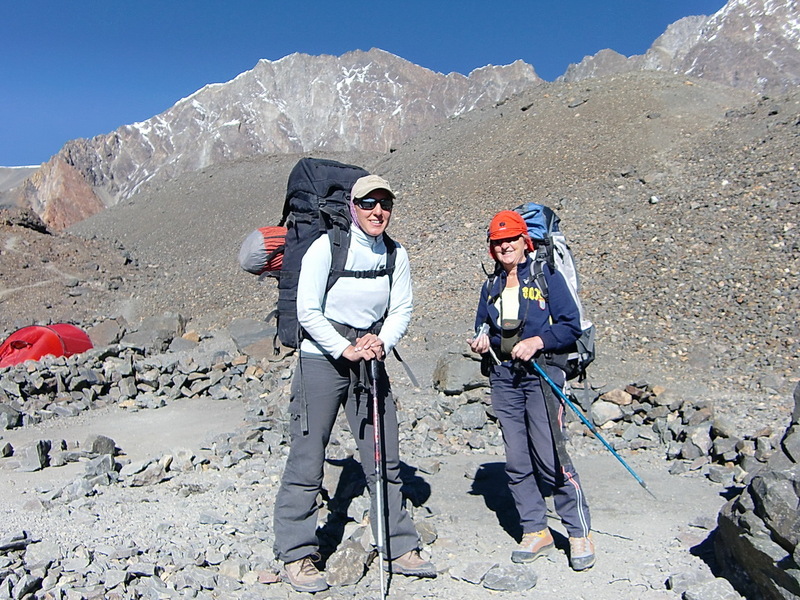 Early noon we arrived in the base camp El Salto, which is approximately 4200 meters high. Our stuff was already there and we built up our tent. It is a new one like a half barrel. We had bought it in Cologne last July; the seller had promised us that this tent is the best on storms. But it was very complicated to establish it. And we felt sometimes very dizzy due to the high altitude. We slept early and woke up before sunrise on the next morning: Many stars were on the sky; so we started hiking as soon as possible to the saddle between the two highest mountains, Cerros Plata and Vallecitos. This pass is about 5200 meters high. Some clouds were coming from the East side, but the West was clear. 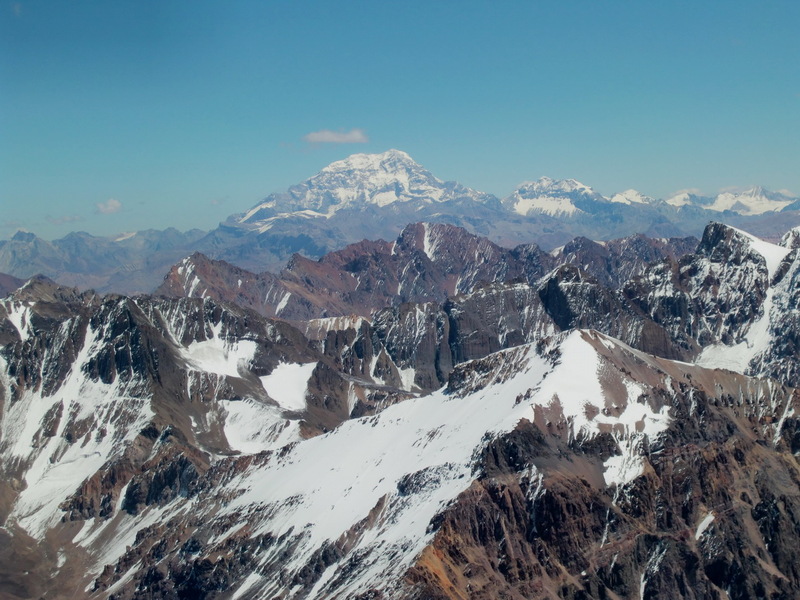 Most of the major peaks of this area like Aconcagua or Mercedario were free and visible. Marion decided due to the clouds and some dizziness to return to the base camp. Alfred continued to the summit of Cerro Vallecitos. The last few meters were a little bit icy and rocky. Thanks to crampons and ice-pick, it was manageable to reach the summit. Especially the last ten meters were challenging: Alfred could see between his legs the big crevasses 1000 meters below - For sure no false step is allowed! 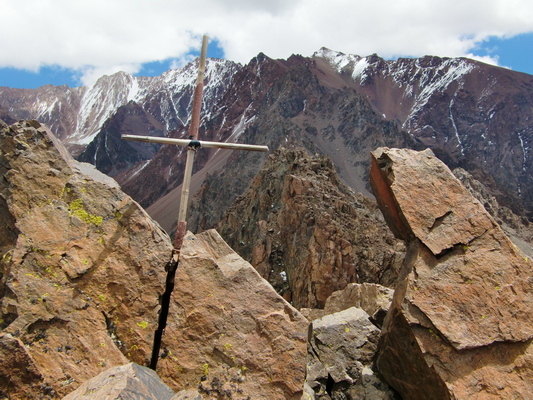 The height of the Cerro Vallecitos is confusing: The cross on the top states 5570 meters, the paper map 5461 meters and the electronic map 5400 meters. Welcome to Argentina! The view from the top was overwhelming: In the East clouds, in the West the High Andes. 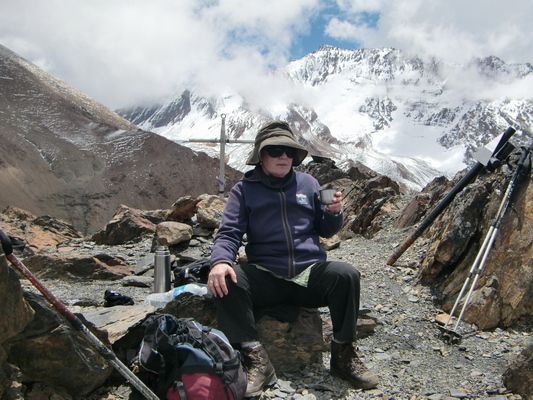 Aconcagua, the highest mountain of America and outside of the Himalayas of our world was dominating the scenery. 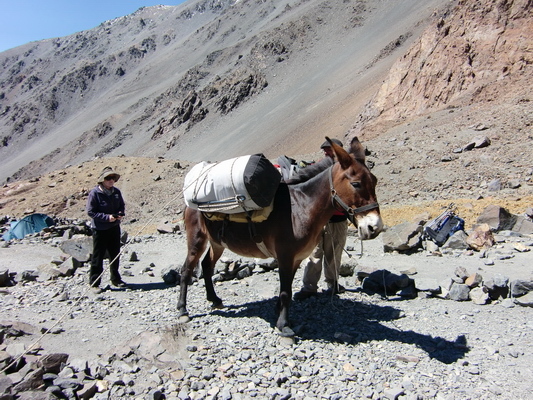 Back to the base camp, Alfred got his price for his mule service on the previous day: Wonderful tortellini from Rosemarie and Marianne. Due to our exhaustion we slept immediately after the dinner, around 6:00PM. We woke up at 2:00AM in the next morning of Monday, January 31st 2011 and again a lot of stars. 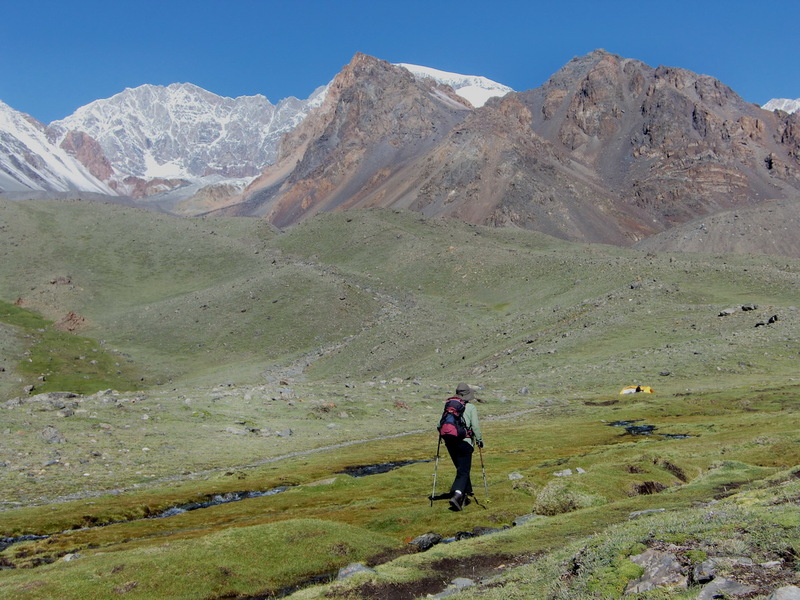 So we grabbed our stuff and started immediately the long, long ascent to the Cerro Plata: Approximately 1700 vertical meters in such an altitude! 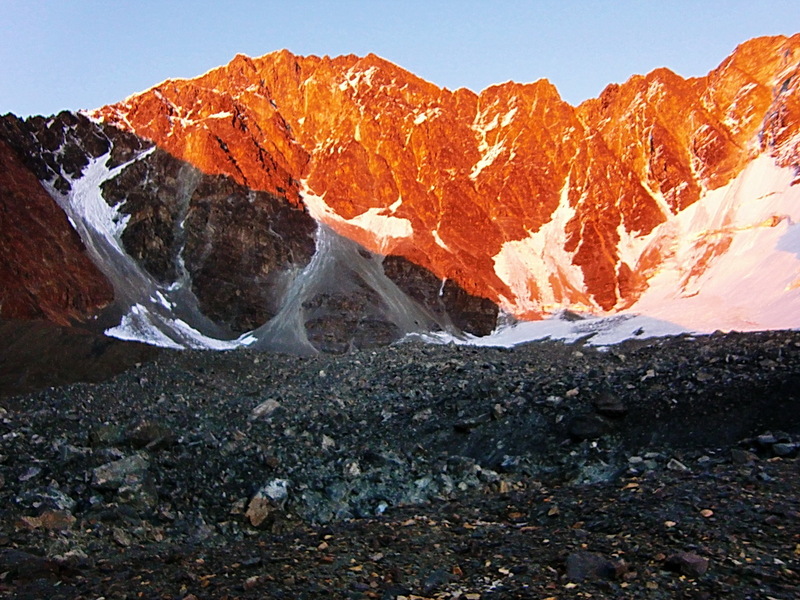 The first light came, when we arrived at the saddle between the Cerros Vallecitos and Plata. It was bitterly cold, we were really happy about our down feather clothing, also the gloves. And some wind came up. When we reached the North ridge of the Cerro Plata the wind became a real storm: We had still more than 400 meters vertical height to go! We had to move some passages backwards and stooped to force against the heavy storm. Snow and ice crystals were shot against our faces. Marion felt two times due to the wind. Fortunately the area was not very steep! 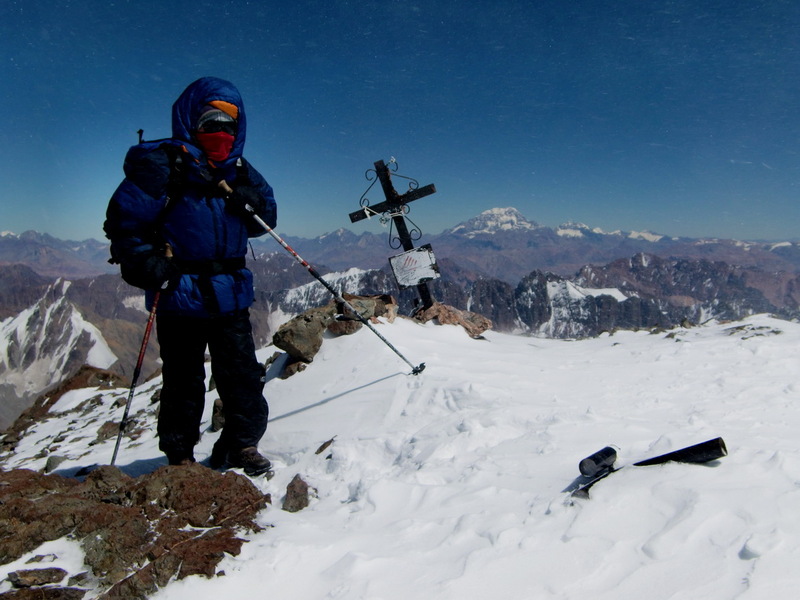 After more than two hours fight we arrived at the summit of Cerro Plata, 5930 meters height, around 11:00AM. It is our fourth highest peak and definitely one of the toughest. We were a little bit exhausted, but also very happy. Put off the gloves was very critical, because the hands and fingers were icy immediately. It was really challenging to take some pictures of the outstanding views. Fortunately our camera worked properly. We were the only people at the summit on this day, because Rosemarie and Marianne had returned on the saddle due to the storm. The descent was also long, long and long. We came back to our tent around 5:00PM, took a short dinner (noodle soup) and felt asleep soon. We had no intention to wake up again in the darkness. Originally we had asked Pancho, our mule drover, to pick us up on Wednesday to have a spare day. Consequently we planned to have rest day on Tuesday at the base camp. But he came already on this Tuesday and waited until we packed our equipment. Thanks a lot Pancho! We finished our stuff with the help of Pancho approximately at noon. We were back at the Vallecitos ski station at 4:00PM. The first cool beer was fantastic. And we could take a shower - It was overwhelming. 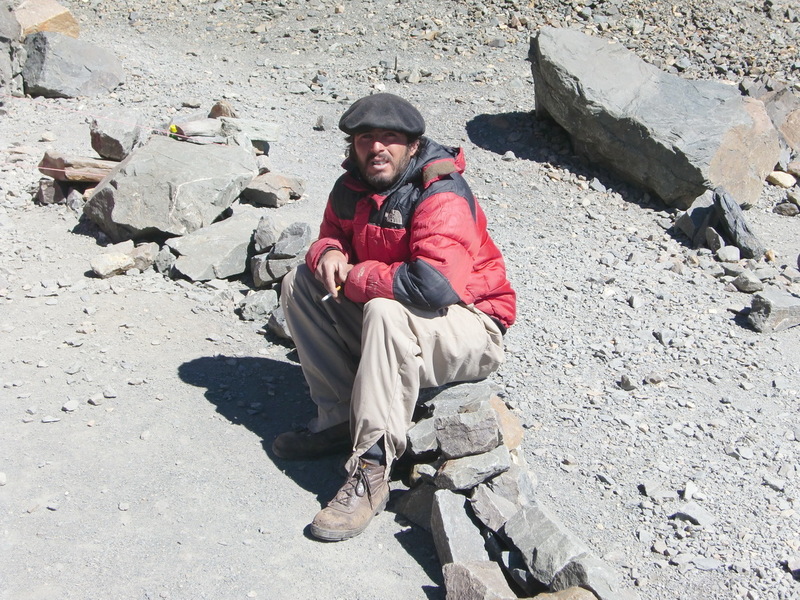 We had some conversation (Spanish / English) with Pancho, who had been a little bit cagy on our ascent to the base camp. But now he became open and communicative. 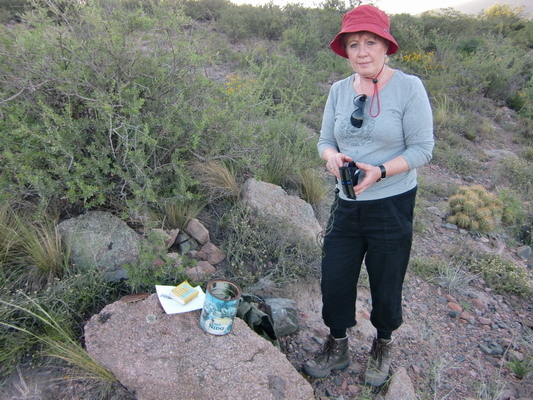 The next day we found our second Geocache La Crucecita-Mendoza-Argentina on the foot of the Andes. It was a very beautiful late evening: On the one side the sunset over the Andes and on the other side million lights of Mendoza. We could spend a quiet and calm night close to this cache. And we slept till 10:00AM in the next morning!